90% of Wisconsin cows’ milk goes into cheese. Don’t have a cow, but California is indeed the leading producer of milk on the United States. However, Wisconsin is the leading producer of cheese, which is more important. Because it’s what you make of what you have - and Wisconsin curdles California when it comes to cheese. Wisconsin also takes the cake in cows per capita, ringing in 4.5 people for every bovine. The US produces about 25% of the world’s cheese, and Wisconsin produces about 25% of that. So Wisconsin produces more than 6% of the world’s cheese. to cheese Wisconsin has both. 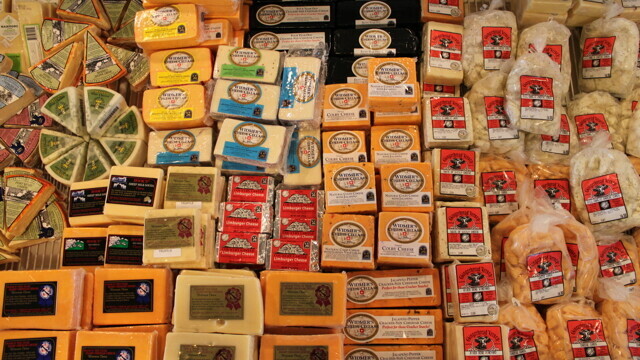 Wisconsin cheese makers produce more than 600 varieties of cheese, while California produces 250. And in the 2012 World Championship Cheese Contest, Wisconsin took home 30 gold medals, while California only had three. $20,000 a year in economic activity. 86.8% of dairy farms in Wisconsin. California produced 41.5 billion pounds of milk in 2011, leading the nation. Wisconsin was a not-so-close second with 26.1 billion pounds. However, Wisconsin produces rougly 400 million more pounds of cheese per year than California.